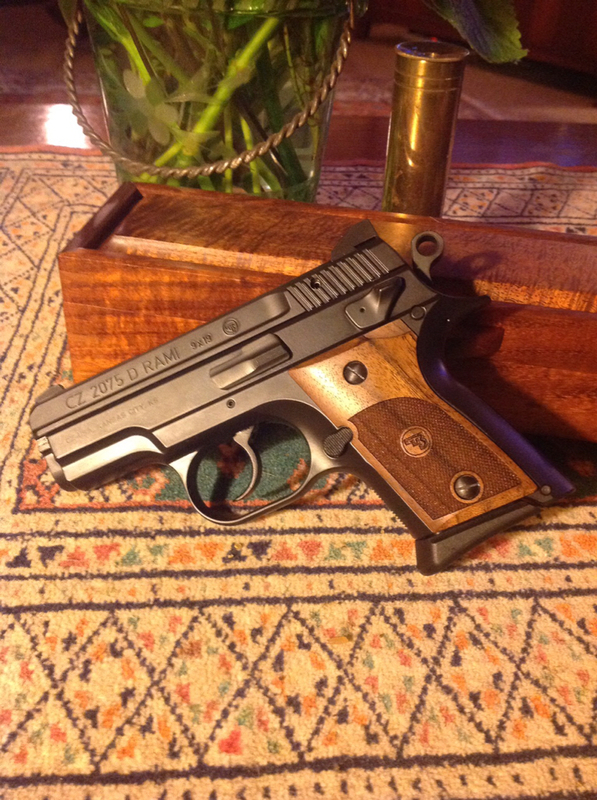 The seldom seen CZ Rami, in the "BD" decocker configuration, is mine at last. I pretty much gave up on ever finding one a while back, and I have not been in acquisition mode as of late, but one came up when I randomly looked at Texas Gun Trader on Saturday. Turns out the seller lives in Plano, the community adjacent to mine. A Chinese guy too; big time into guns. There are plenty of striker fired polymer subcompacts on the market for CC, but honestly my preferred operating system is a DA/SA hammer fired pistol, and the options are limited. The CZ Rami seemed to check all of the boxes, and gets rave reviews, but they are so rare and hard to find. I figured I better jump on it immediately or I may never see one again. I'm taking it to the range on Friday for some extensive testing with FMJ and my preferred JHP ammo. Like new in box, factory night sights, with a 10 round mag and a 14 rounder with grip sleeve. The nice thing is it can also take the higher capacity CZ 75 9mm mags. I approve of this purchase. Congrats, a CZ! Bucolic has one and I've looked at them but passed for now. If we had the polymer framed one here in CA I might be interested, for now I'm happy with the P-01 that has a decocker and alloy frame. I like SA/DA though I understand the attraction of striker fired, same pull every time. Let us know how it shoots. Congrats! I had to wait a long time for the BD version but I wanted the same fire control as my Sp-01. I’m now on the hunt for a P-01. Really nice pistol. A little chubby but easy to shoot. I love the aftermarket grips. I think it makes the gun look like a Rottweiler or a Doberman. My only other CZ is the full size P-09 which is in my carry rotation - OWB at 3:30 in a close fitting belt mounted kydex holster. I'm going to try appendix IWB carry with the RAMI. Oh, yeah. I just remembered I DO have a third CZ, a Scorpion pistol with folding "arm brace". Nice... Chinese guys collect and find exotics the best. I’m also lusting after a short barreled Scorpion with that folding “arm brace”. I am curious about the scorpions. Are they fun or does the novelty wear off? They certainly look like fun. I need to get a P-01 before I consider another CZ. I have one that I carry in an Aliengear holster. I fed it couple of different kind of hollow points, flat tip round nose 115 and 124 gr. Never had any issues of any kind. My Scorpion is definitely a blast to shoot at the range. I put an inexpensive Bushnell TRS-25 red dot sight on the top rail which makes target acquisition really fast. And with the arm brace braced, it dawned on me just how easy it is to hold it steady and rapidly put multiple rounds through a golf ball sized hole at around 45 feet. It's way too easy to burn through 100 - 150 rounds in a fraction of the time it would take shooting one of my pistols. So it's a super fun range toy, and I suppose it has potential as a home defense weapon, but in a way it makes shooting effortless. The shots I was making with the Scorpion without much thought are darn difficult with my other pistols, so I felt I wasn't building up my skill level in any way that would translate across platforms. At the end of the day it's kind of like the roadster that sits in my garage under a dust tarp. Super fun to take out for a spin when I'm in the mood, but not an everyday kind of thing. Thanks! I understand your simile having a couple tarped convertibles myself. I probably won’t put one on my wish list but I do appreciate the attractions the Scorpion. These days, most of my shooting has been spent optimizing accuracy of both my guns and myself. I no longer feel the urge to do mag dumps. ( not that there’s anything wrong with that). I have been doing the same thing. Slow and steady, focus on the trigger pull and the breathing and try not to flinch. It really pays off after a while. Update: I probably have about 500 rounds through the Rami as of my last range session. Very pleased with the accuracy so far. Not as a snappy as some of my other subcompact 9mm pistols. The weight of the metal frame plus the low bore axis inherent in the CZ rail design probably helps a lot. There was an odd issue with the trigger not fully engaging the hammer a few times during dry fire. A quick online search revealed that the trigger bar lifter spring was not tensioned properly. Not enough upward pressure on the trigger bar, so it was not consistently engaging the surfaces of the disconnector when trigger pulled. I bent each spring arm upward a bit and the issue went away. I went ahead an ordered the Cajun Gun Works firing pin roll pin for both the Rami and my P09. Roll pins were peened in both pistols. Apparently a known problem in CZ 75 variants. The CGW pins are supposedly made of sturdier stuff. I’m curious if you’ve tried appendix carry with it yet and if so how it fit/felt. I changed those roll pins when I installed the Cajun Gun Works extended firing pin along with reduced power springs. Lightened up both DA and SA trigger pulls nicely. I like my RAMI but it is a bit chubby for IWB carry. On the rare occasions that I do carry, I pocket carry it in a pocket holster. As a person of dignified taste and impeccable aesthetic, well you should be. It sort of leaves my Shield 9 looking like a plastic brick... Oh well. She's ugly, paid for and in hand (er, safe). Stop it! I must look away. Funny thing, I acquired my ugly little Shield and an LCP that (that was off roster, so only way to get one was used) on a trade for a P228 that I never really loved--some would call that a bad trade, but it got me two very different guns for one I didn't like. But the P228 was infinitely better looking.